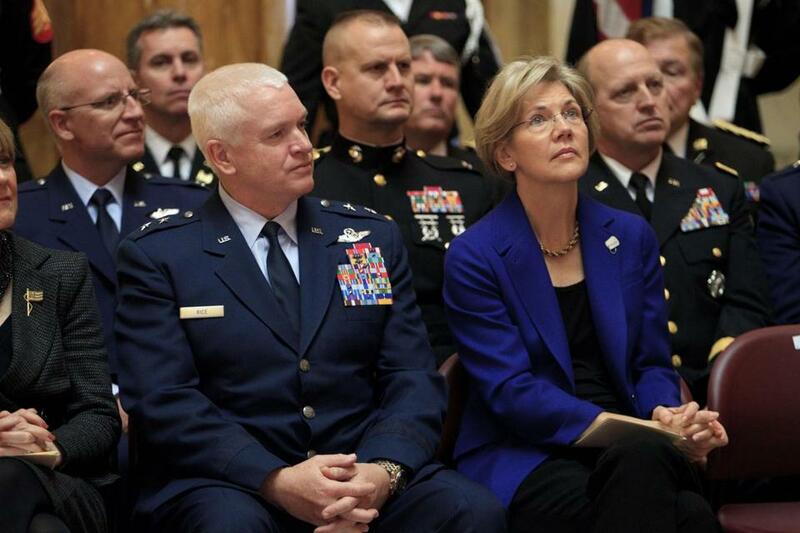 Senator-elect Elizabeth Warren and Massachusetts National Guard Major General L. Scott Rice (left) attended the Veterans Day ceremony Sunday at the State House. WASHINGTON — It is one legacy of Senator Scott Brown’s tenure in Washington that Elizabeth Warren may want to continue: champion of the defense industry, a critical component of the Massachusetts economy. But how the liberal senator-elect will come down on one of the most pressing issues facing the new Congress remains a burning question for industry groups and company executives who are wary of the former Harvard professor and have been relying on Brown, a member of the Armed Services Committee, to protect Pentagon contracts, military bases, and thousands of Bay State jobs that depend on them. “The defense technology community in particular is not quite sure of whether she is going to be supportive at the end of the day,” said Chris Anderson, president of the Massachusetts Defense Technology Initiative, which represents Waltham-based defense giant Raytheon, Textron, General Dynamics, BAE Systems, and other large and small defense companies and research universities in Massachusetts and across the region. “She has an obligation to major sectors of the Massachusetts economy that are inextricably linked to the federal government,” Anderson said. The defense industry was certainly not banking on Warren’s victory over the Republican incumbent last week. Campaign finance records show that defense firms contributed nearly 30 times more money to the campaign of Brown, a colonel in the Army National Guard, than Warren — $319,000 versus $11,000. So far Warren has said little about her views about what programs should be funded and which ones should be cut, only to say that she supports reduced military spending as long as the cuts are made carefully. She also expressed a desire to invest in certain capabilities that are a strong suit for Massachusetts companies and universities, while slashing other areas. Warren has privately shown a desire to build bridges to the defense sector in Massachusetts. For example, two people with direct knowledge said that back in June, in the heat of the campaign, she initiated a phone call with William Swanson, the chief executive of Raytheon, which is the state’s largest single employer. However, from his perch on the Armed Services panel, Brown has been considered a sure bet by the industry, including taking a leading role in protecting the Electronic Systems Center at Hanscom Air Force Base in Bedford from cuts. Earlier this year, he also helped to fashion a deal later approved by Congress to expand the base, while also playing a key role in reversing millions of dollars in proposed cuts to an Army communication system developed by General Dynamic’s facility in Taunton. “Brown was effective and improving in his effectiveness,” Anderson said. According to the Defense Technology Initiative, the defense industry employs more than 130,000 people in Massachusetts and generated $14 billion in contracts in 2011. But even as Warren is lobbied hard by such a powerful bloc, she is also likely to hear from those in her political base who believe deep cuts to military spending are necessary in order to invest in other national needs — even if it may have adverse effects on local economic interests. Frank said that many of the necessary cuts, such as to overseas military bases or troop levels, would not have much impact in Massachusetts. But he acknowledged that in some ­cases, weapon manufacturers in the region may be impacted by reduced defense spending. Charles Knight, codirector of the Project on Defense Alternatives in Cambridge, suggested one example involved the F-35 jet fighter for the Air Force, Navy, and Marine Corps. “It’s premature to invest that much in a new generation of aircraft that is three times as much as the one it is replacing,” he said. According to the prime contractor, Lockheed Martin, there are 99 suppliers for the fighter jet program that account for nearly 1,500 jobs in Massachusetts and account for an estimated $90 million worth of economic activity. There are more than 6,000 F-35-related jobs in New Hampshire, according to the company. US Representative Bill Keating, a Cape Cod Democrat, said Warren will have to walk a fine line between voting for reforms that cut wasteful defense spending and protecting jobs back home.